Planting Pole Beans - How To Plant Your Garden With Climbing Beauty! If you want a little garden fun this summer, try planting pole beans for your very own Jack-In-The-Beanstock show! Planting pole beans is a great way to increase yields for fresh eating and preserving. Not to mention, it can be downright fun to watch the plants as they soar to the sky. Pole beans can produce large amounts of produce. And because of their vertical growth, they can save on valuable garden space. Depending on the variety grown, vines can travel from 6 to 15 feet and more. And many can keep on producing right up until frost. 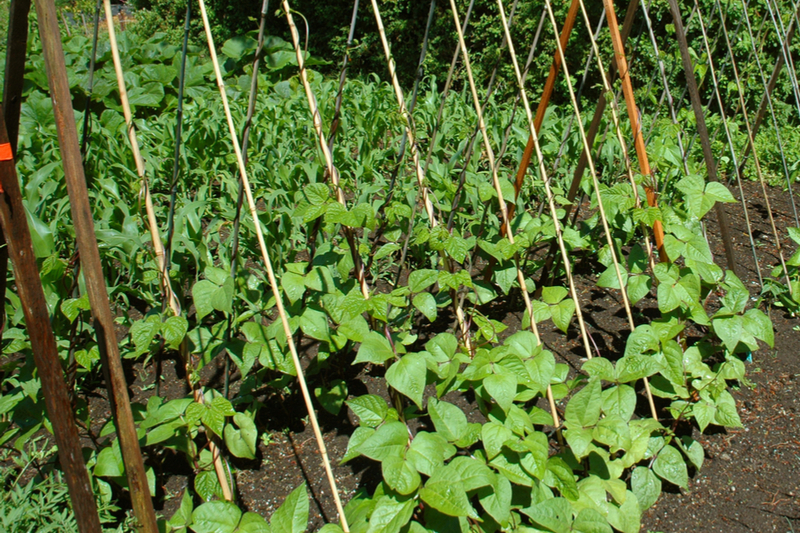 Pole beans prefer a nice, sunny location for optimum growth. Plant seeds 1″ deep, thinning germinated seeds to about 4″ between plants. Beans are quick to germinate, usually popping up through the ground in as little as 7 days. When it comes to soil needs, beans are one of the most forgiving crops around. In fact, as a legume, they actually help to improve the soil they are planted in. They do this by fixing nitrogen levels in the soil, creating better growing conditions for the next crop to be grown in the space. With pole beans, there is no need for additional fertilizing after planting. Mixing in a bit of compost at planting time is more than enough to provide plenty of nutrients for the entire growing season space. What is extremely important when growing beans is providing plenty of support. Vines grow rapidly, and supporting them keeps the plant manageable and easy to harvest. How you support them is up to you. A simple cattle panel or wire fence can work perfectly in the garden. If you want to fancy it up a bit, you can create totem pole trellis from bamboo or old sticks. They are also perfect to grow on fences or arbors. Not only do they look fantastic, they provide a lush area of shade underneath! Read on below for some great varieties to try in your backyard this year. Be sure to check out all of our vegetable garden articles on our Vegetable Tips Page. Want to showcase your backyard garden or gardening tip on This Is My Garden? Email us today at info@thisismygarden.com, and you might be our next feature! This article may contain affiliate links.